How can schools be better designed to enable equitable academic outcomes for culturally and linguistically diverse children from communities lacking in economic, political and social power? 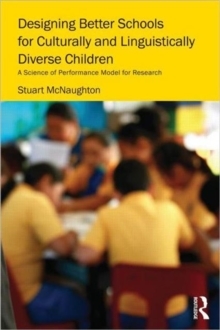 Putting forward a robust `science of performance' model of school change based on a specified process of research and development in local contexts, this book:lays out the traditions of optimism and pessimism about effective schooling for at-risk students reviews the international and national evidence for the effectiveness of schools and school systems in reducing disparities in achievementdescribes the challenges educational research must address to solve the problem of school effectiveness, proposes strict criteria against which effectiveness should be judged, and examines in detail examples where change has been demonstratedproposes how researchers, professionals, and policy-makers can develop more effective systems. Bringing together structural and psychological accounts of the nature of schools, and establishing theoretically defensible criteria for judging effectiveness, this book is a critically important contribution to advancing the science of making schools more effective.